We traveled to Bradley Wood by coach, arriving in the dark with rain predicted. 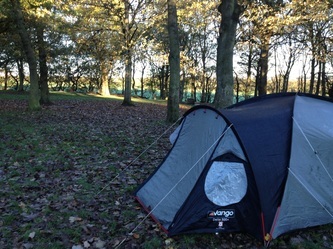 Luckily the rain stayed off until we had put up our tents and shelter in the dark. 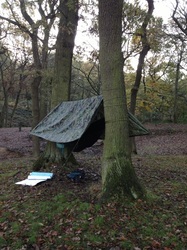 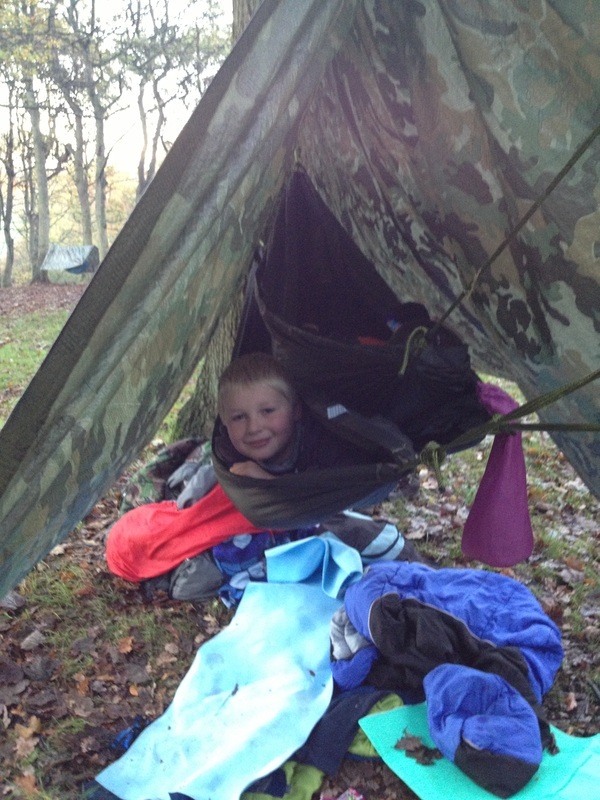 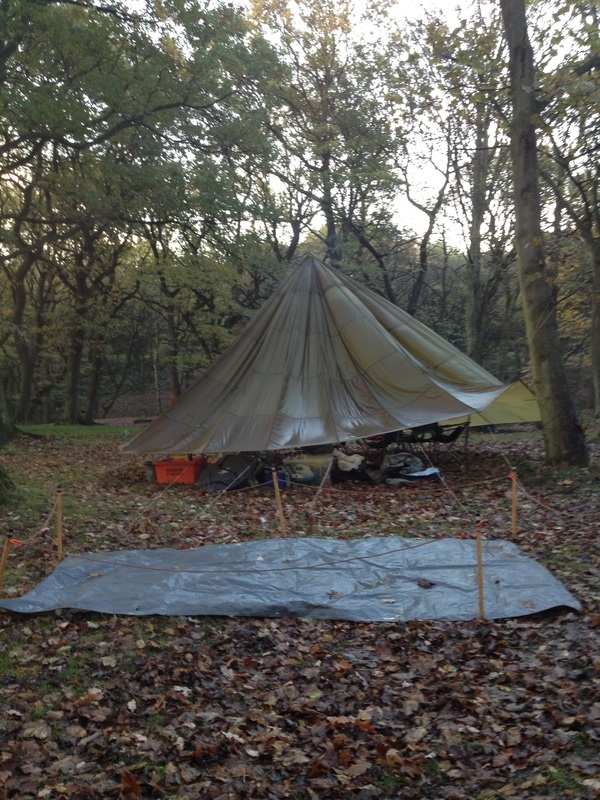 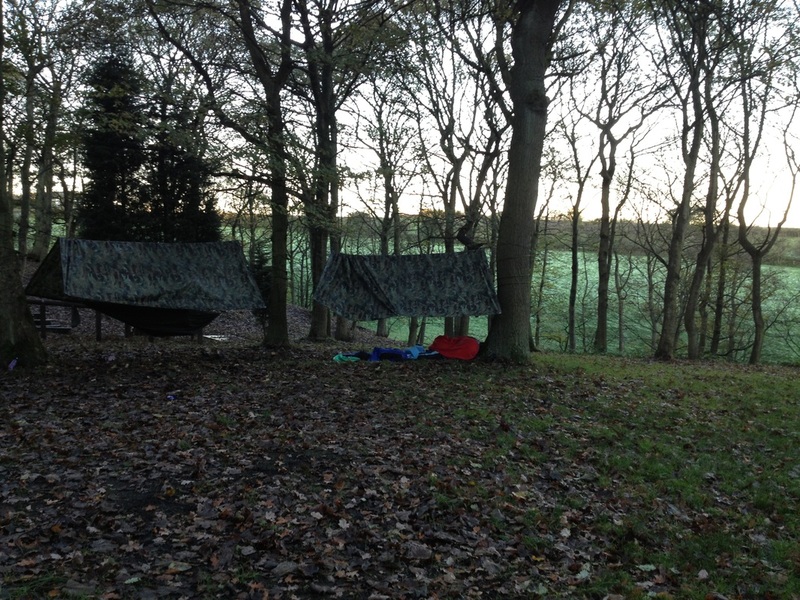 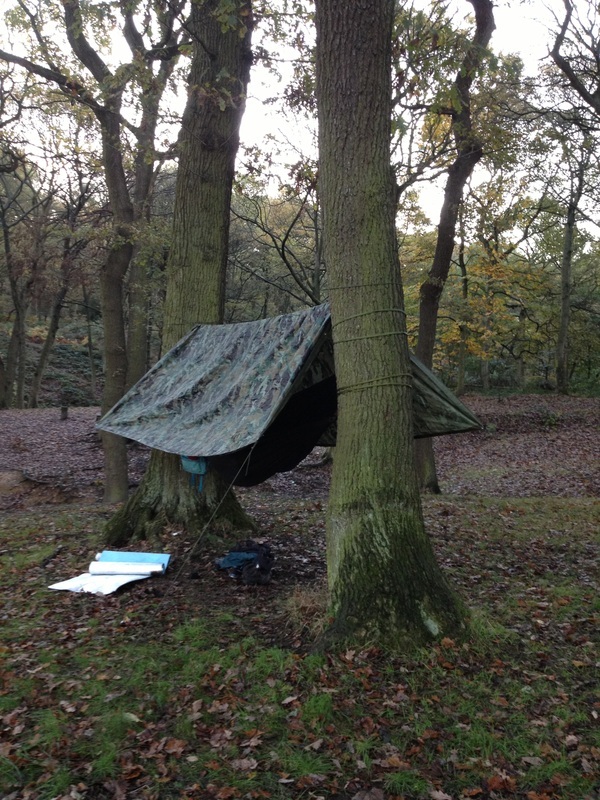 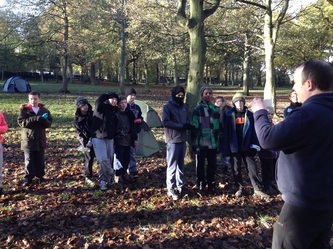 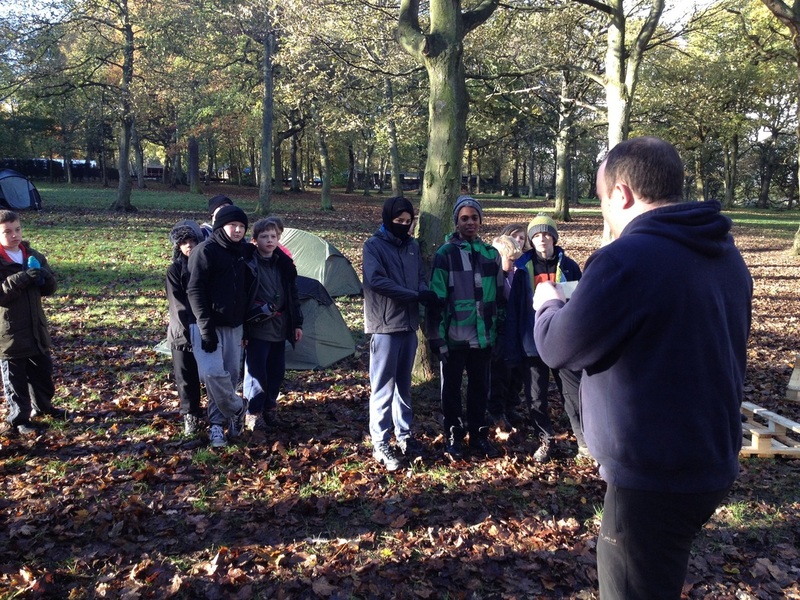 In the planning stage for this camp the Scouts had asked to sleep in hammocks. Since we didn't arrive until fairy late we decided to spend the first night in tents and the second night in hammocks for those brave enough. 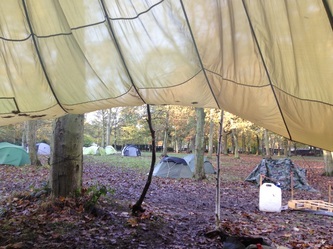 We would leave the tents up anyway so that if anyone got too cold in a hammock they could retreat to a (slightly) warmer tent. Once the shelter was up we got a fire started. 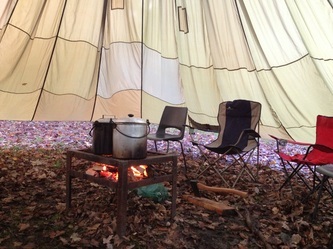 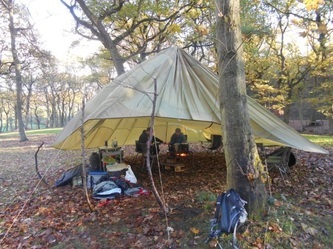 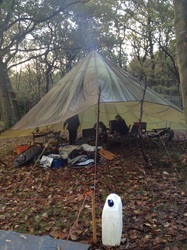 The parachute shelter holds the heat really well and had more than enough room for us all to sit around and generally talk rubbish while eating hotdogs and drinking hot chocolate, all the while the rain outside drumming on the shelter. 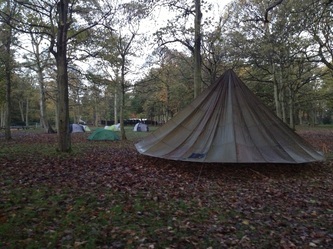 Before we knew it, it was gone 23.00 so everyone went off to bed - although judging by the noise, sleep didn't come until MUCH later. The Leaders were up at about 06.30 to a cold, soggy morning although after hammering down all night the rain had stopped for a while. 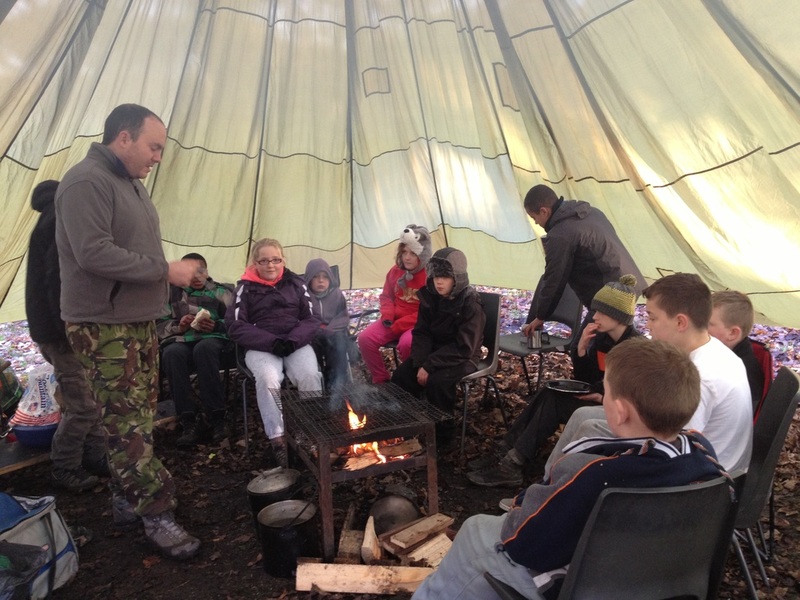 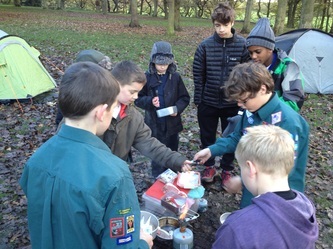 We got the fire going and had a brew in peace before we woke the Scouts up. 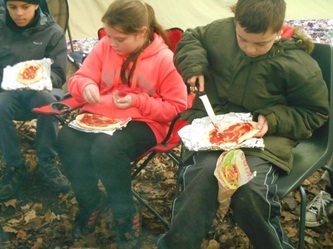 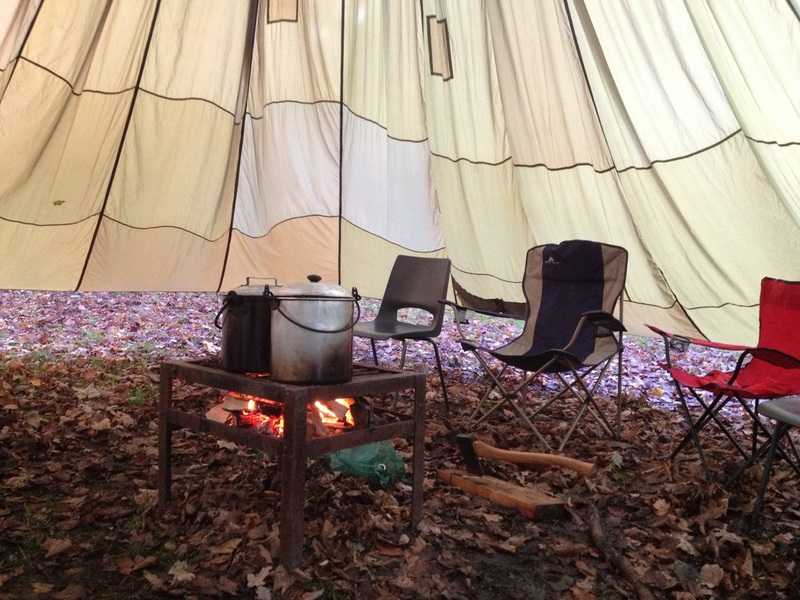 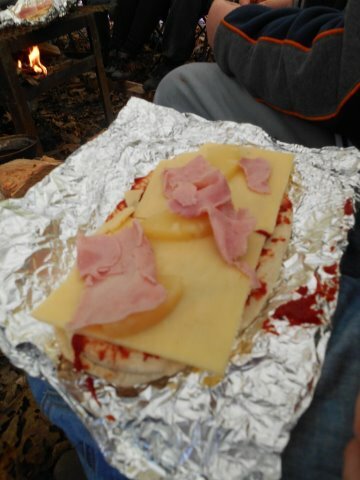 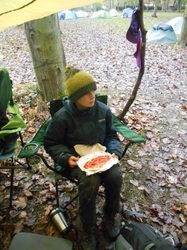 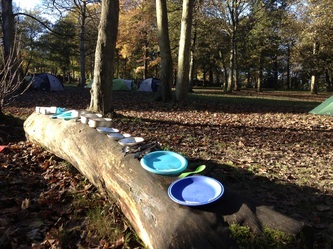 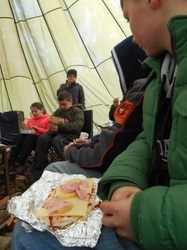 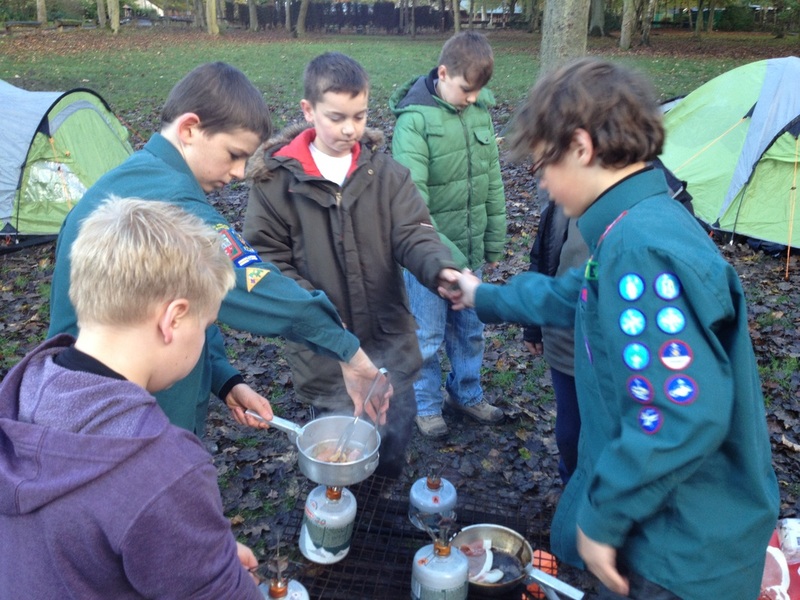 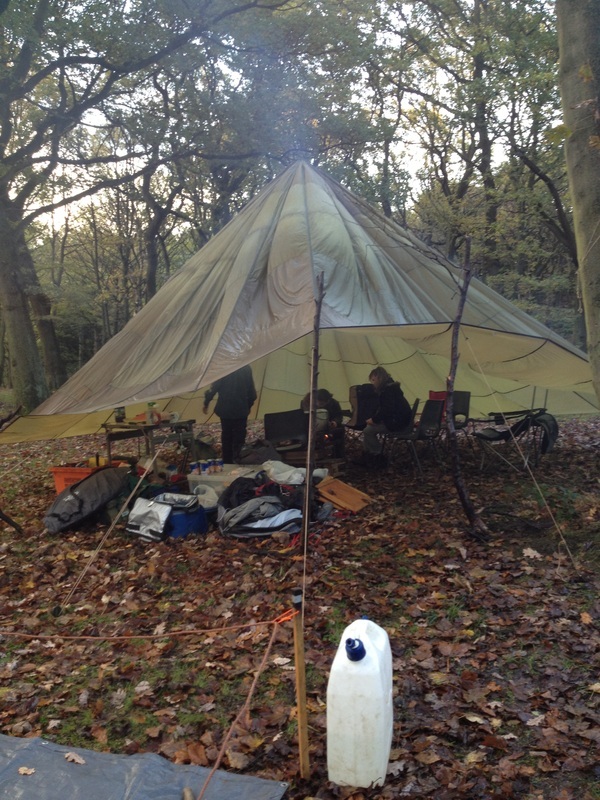 They made their own breakfast, bacon and sausage, over camping stoves - the first time many had ever done this. 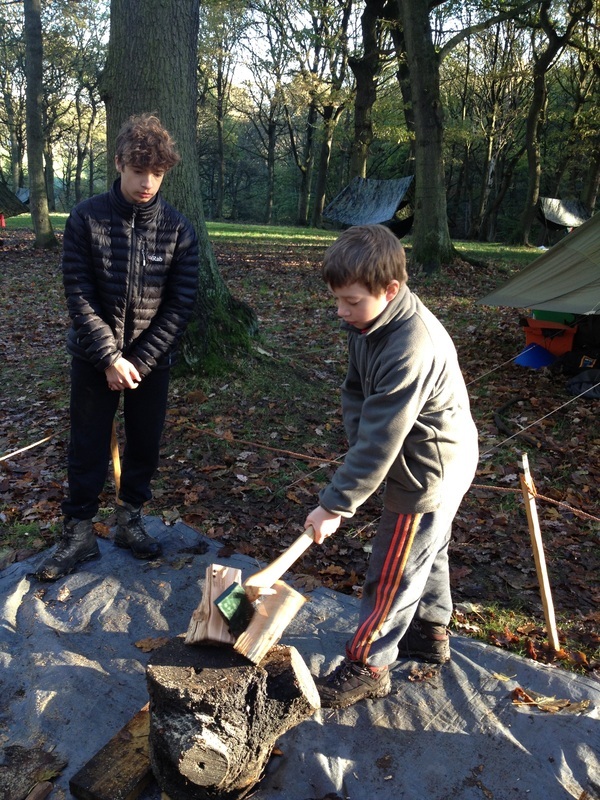 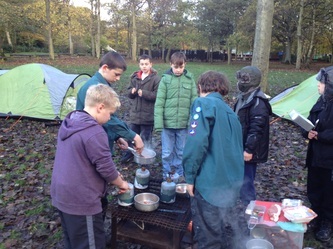 Washing up duties followed and then the Scouts were split into two patrols and had to work in these patrols for the rest of the weekend. 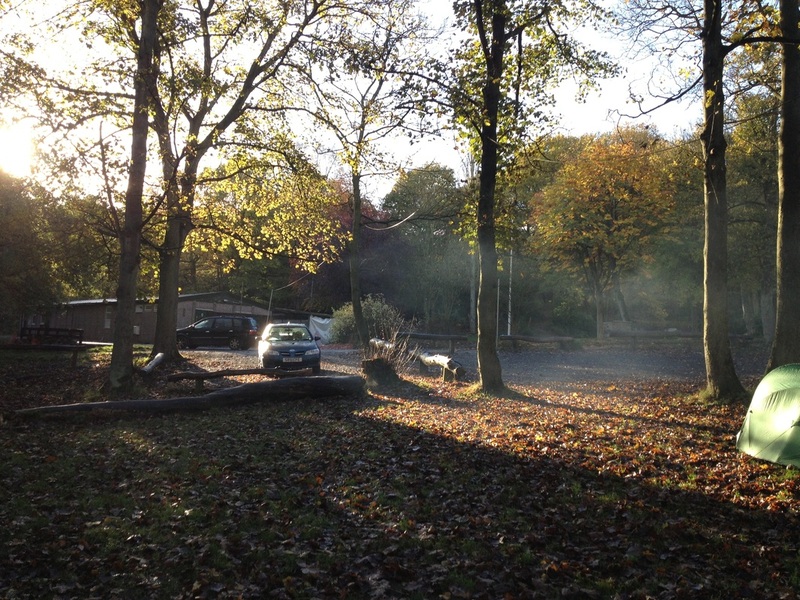 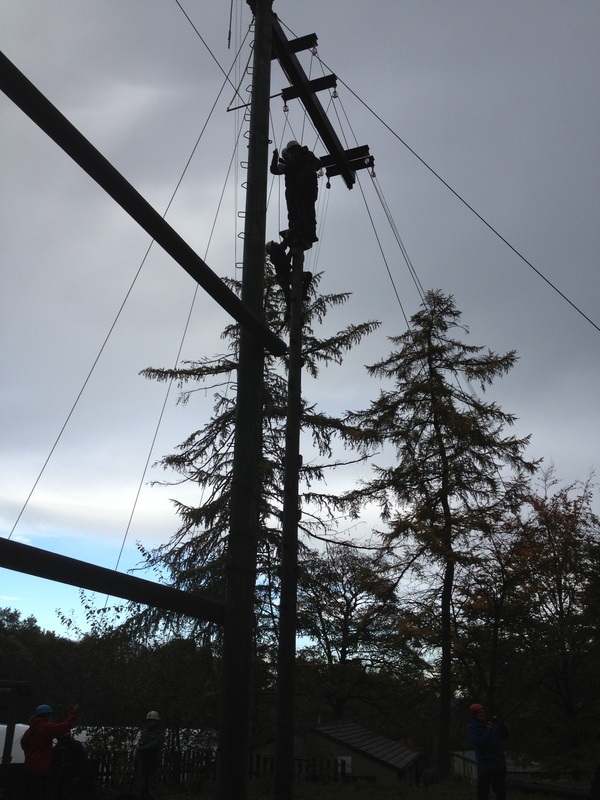 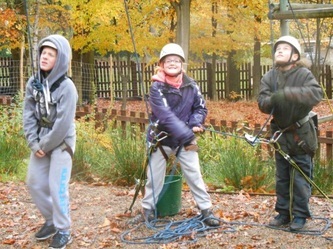 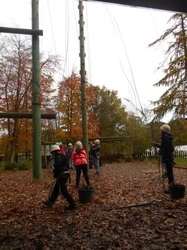 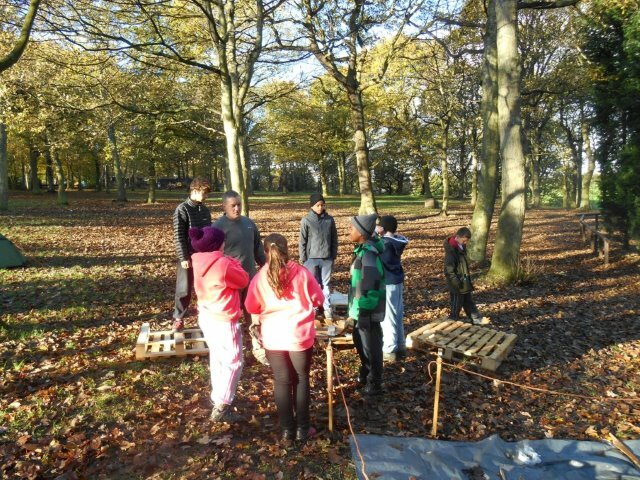 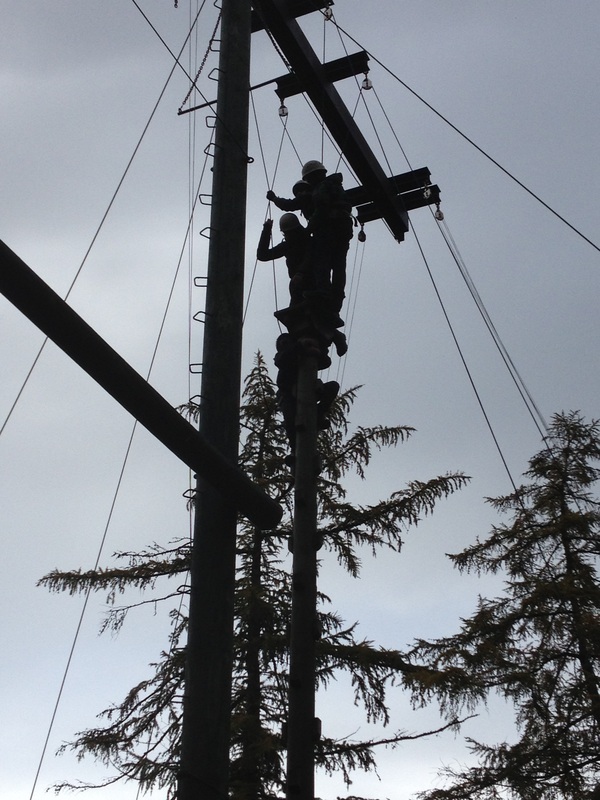 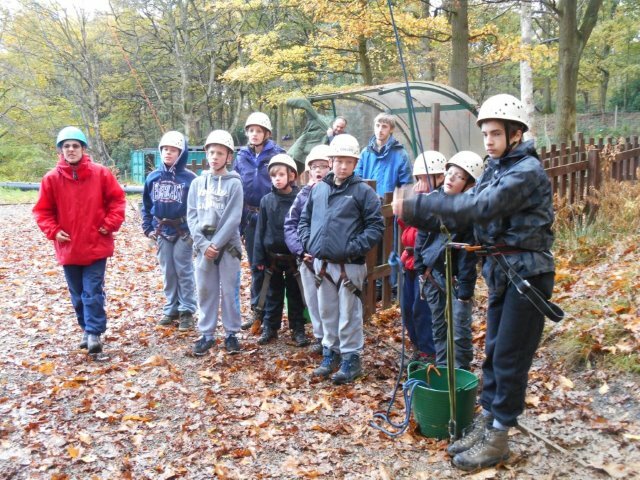 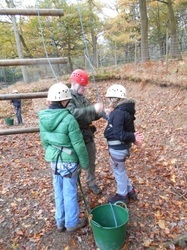 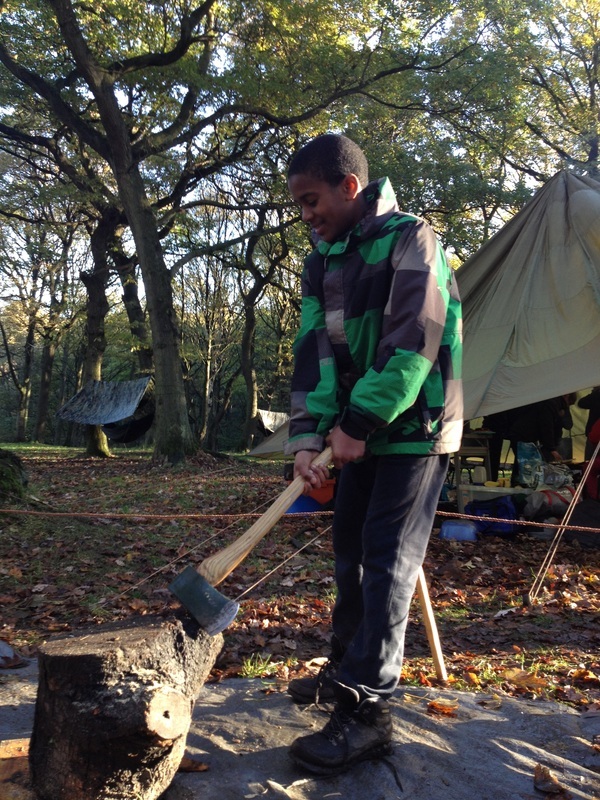 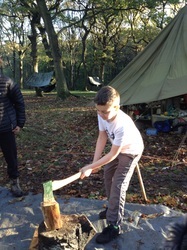 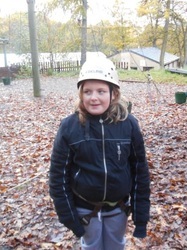 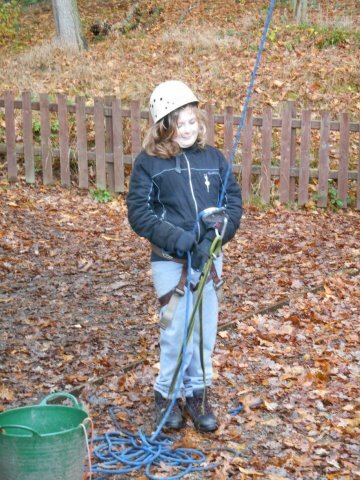 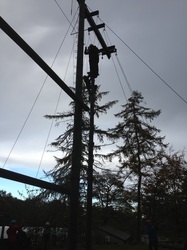 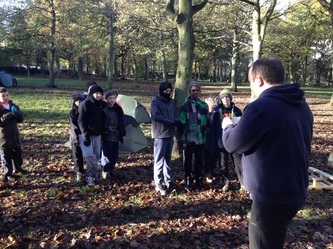 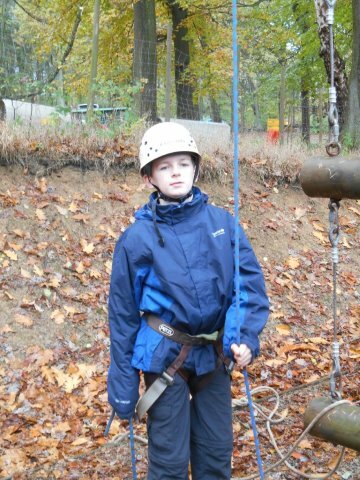 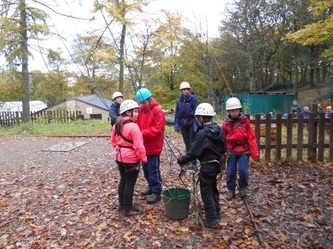 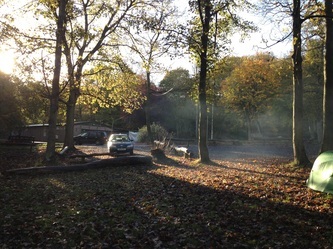 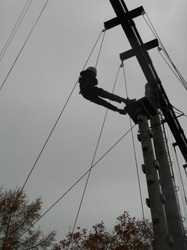 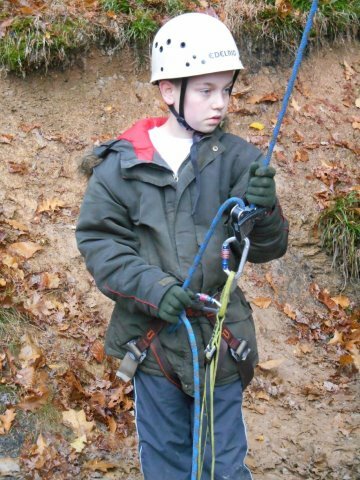 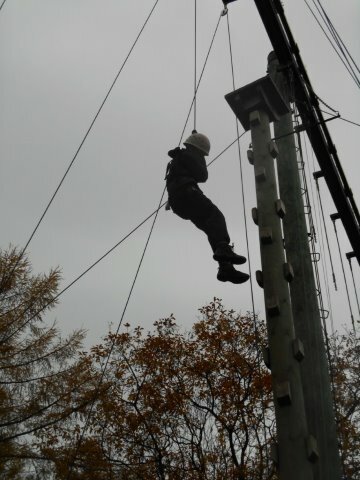 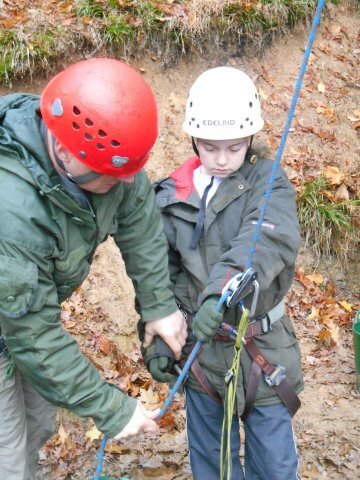 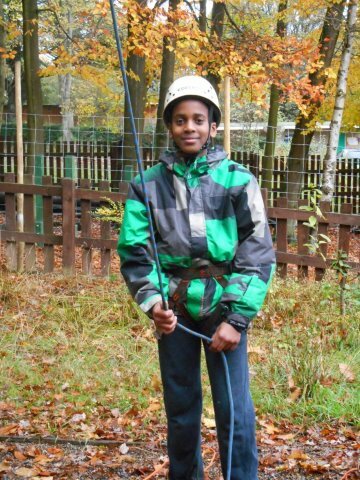 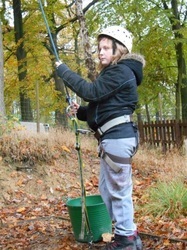 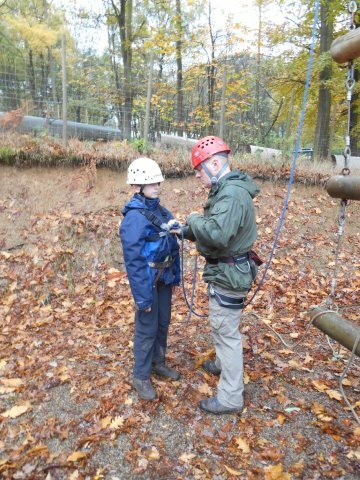 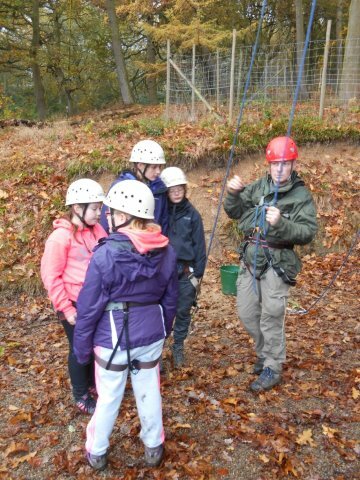 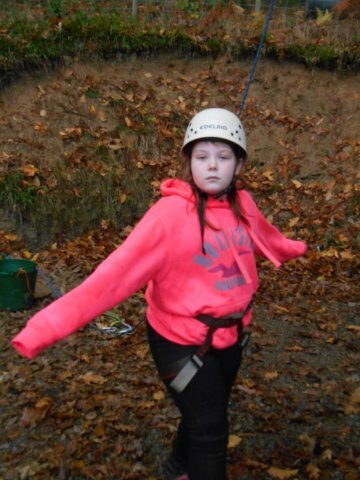 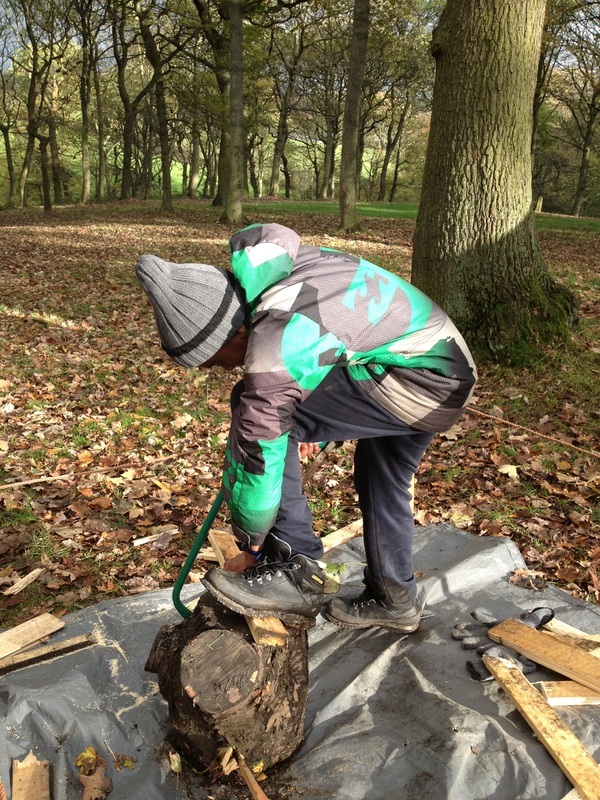 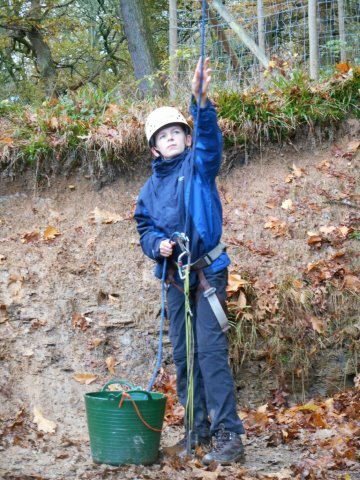 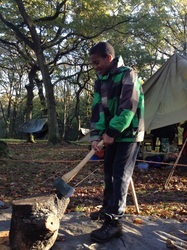 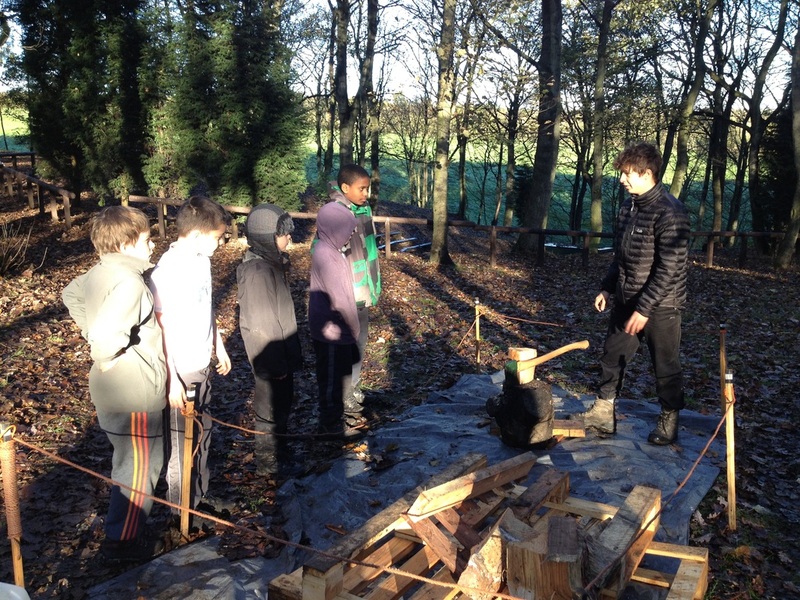 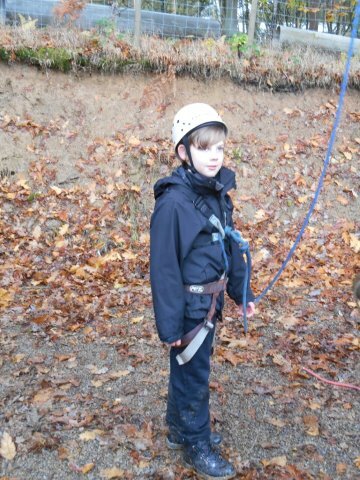 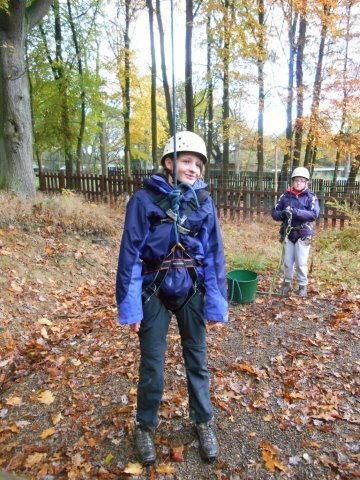 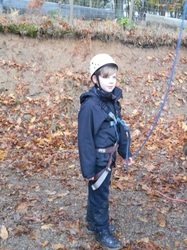 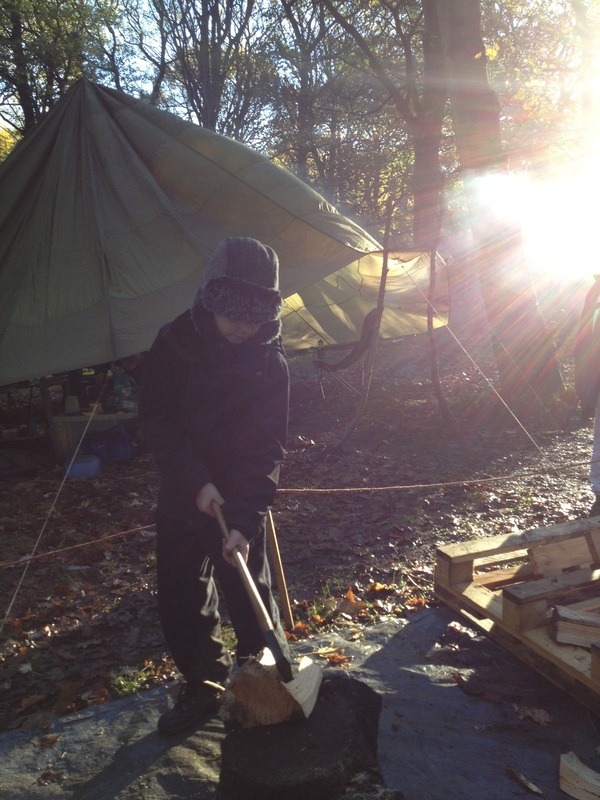 After collecting wood for cooking the evening meal later and generally tidying up the camp area we headed off to the high ropes. 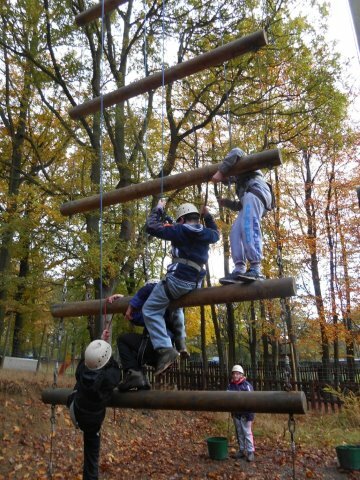 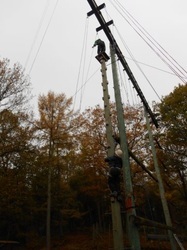 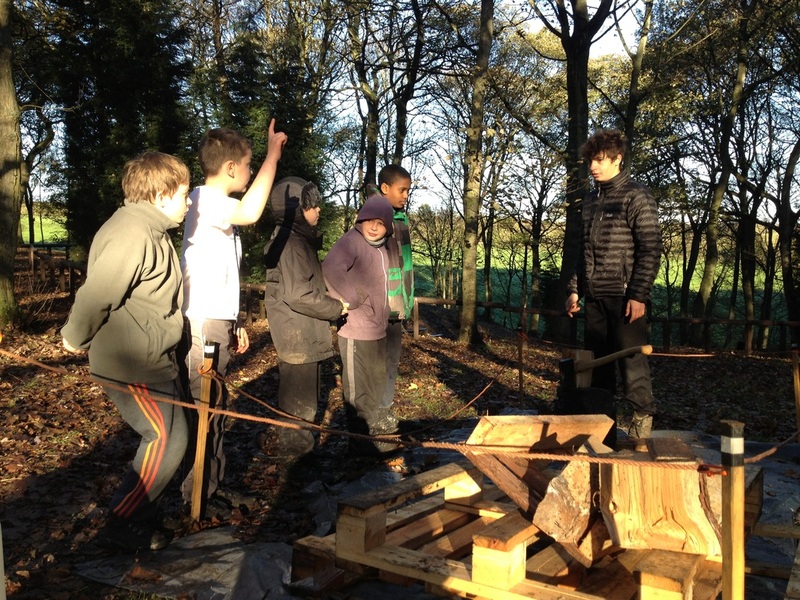 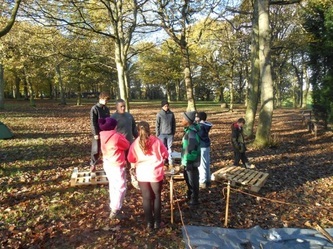 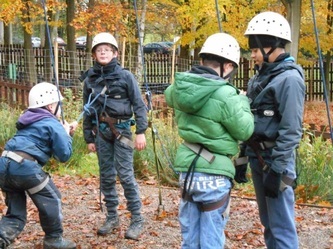 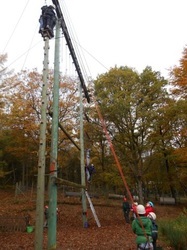 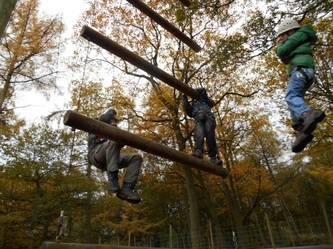 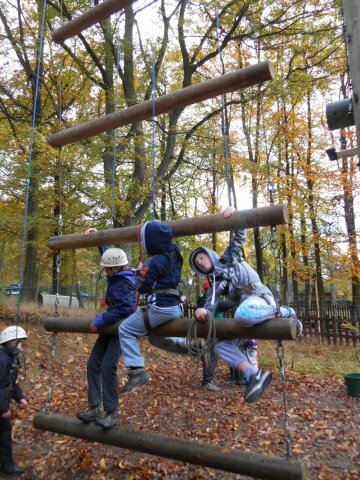 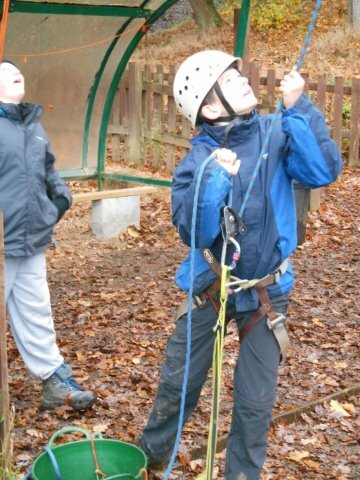 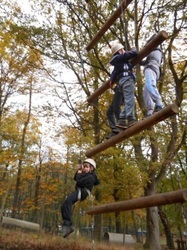 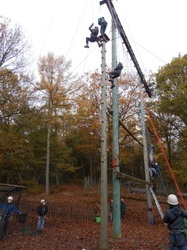 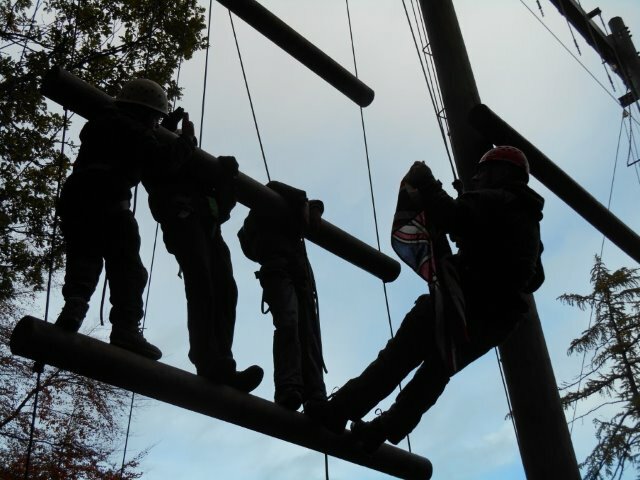 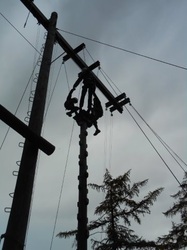 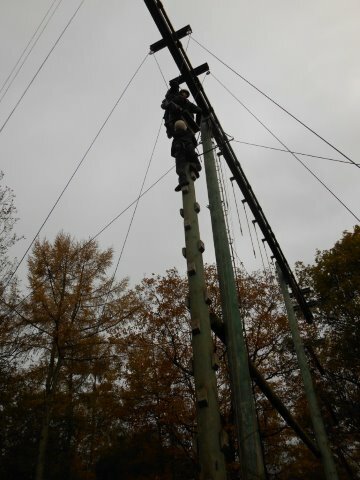 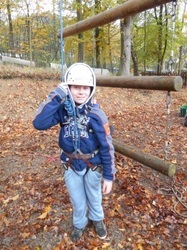 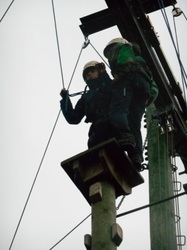 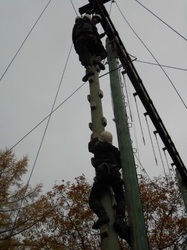 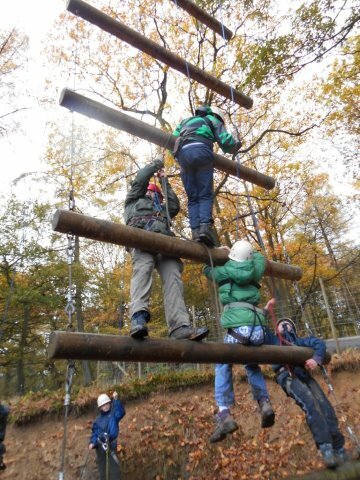 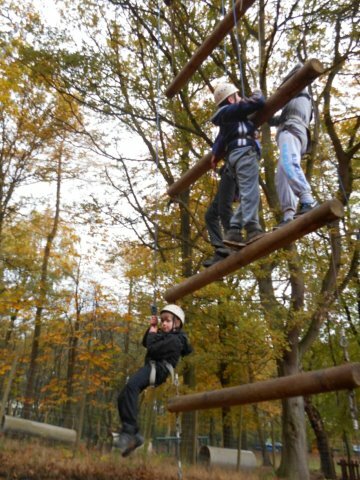 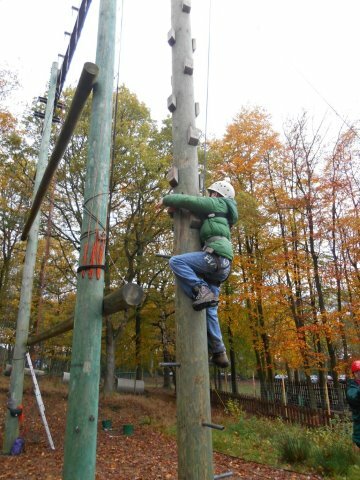 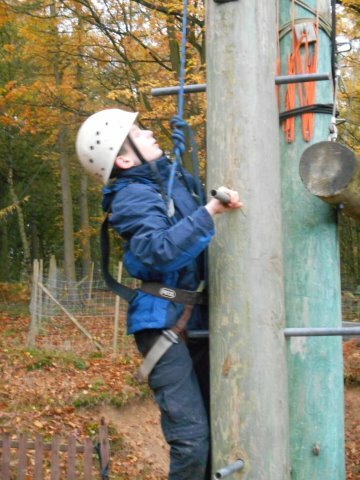 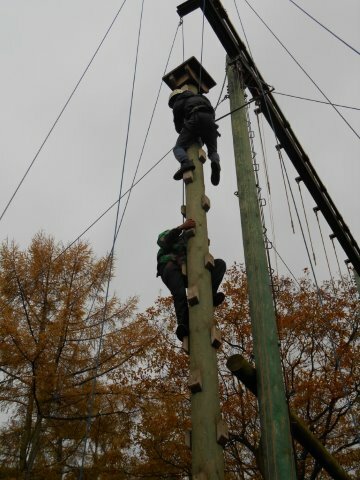 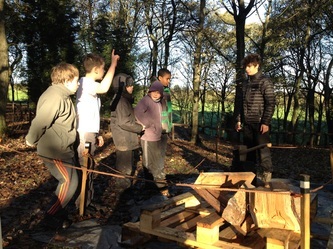 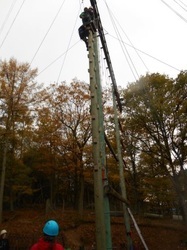 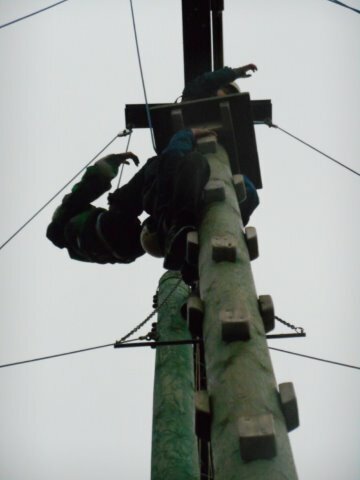 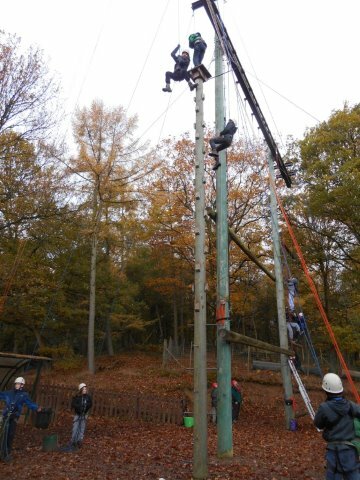 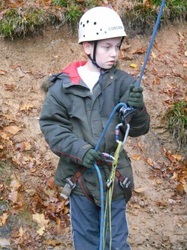 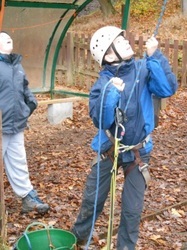 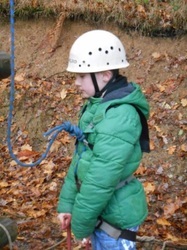 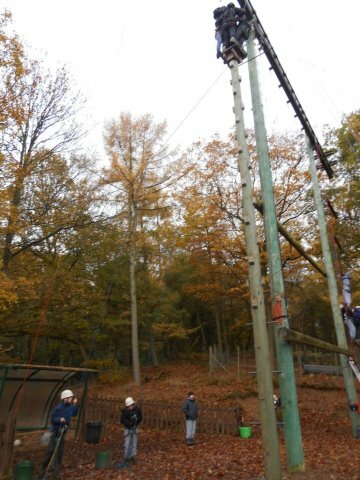 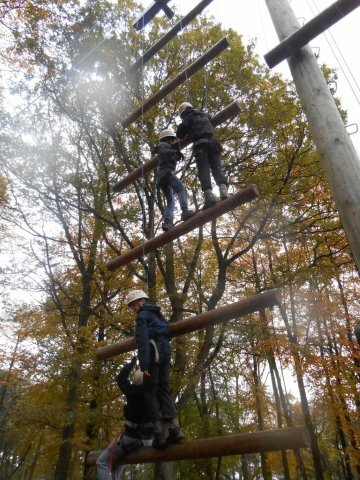 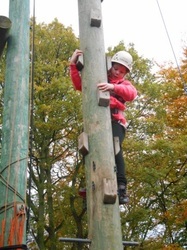 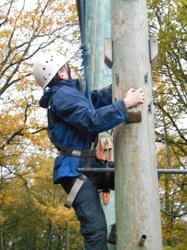 Here the Scouts attempted to climb Jacobs Ladder as a team, a series of horizontal logs with an increasing distance between them the higher up they go. It takes nerve and teamwork to reach the top. 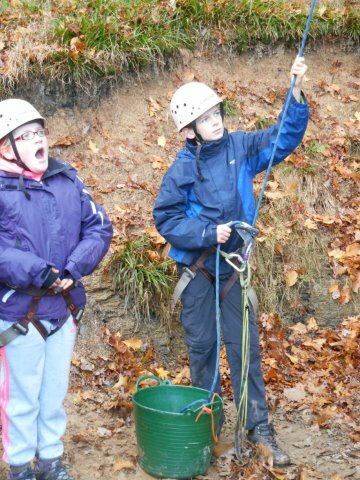 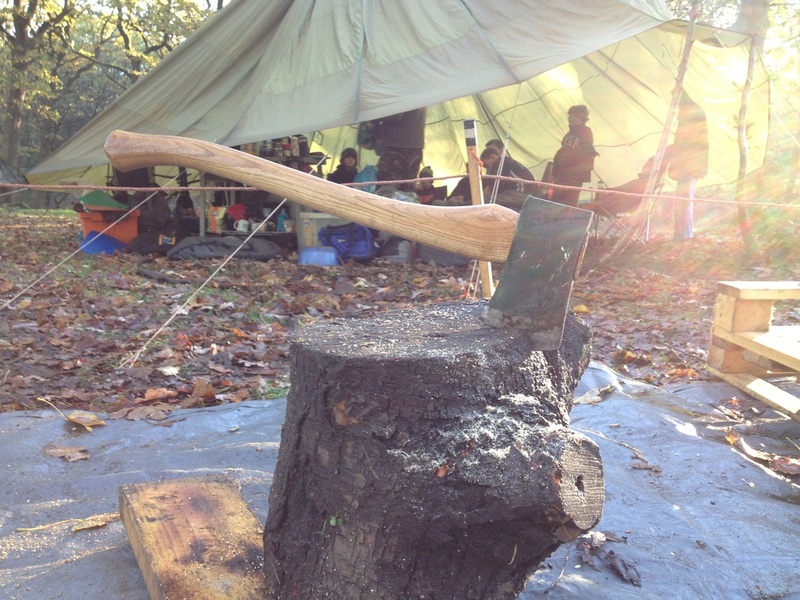 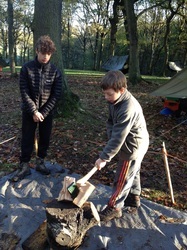 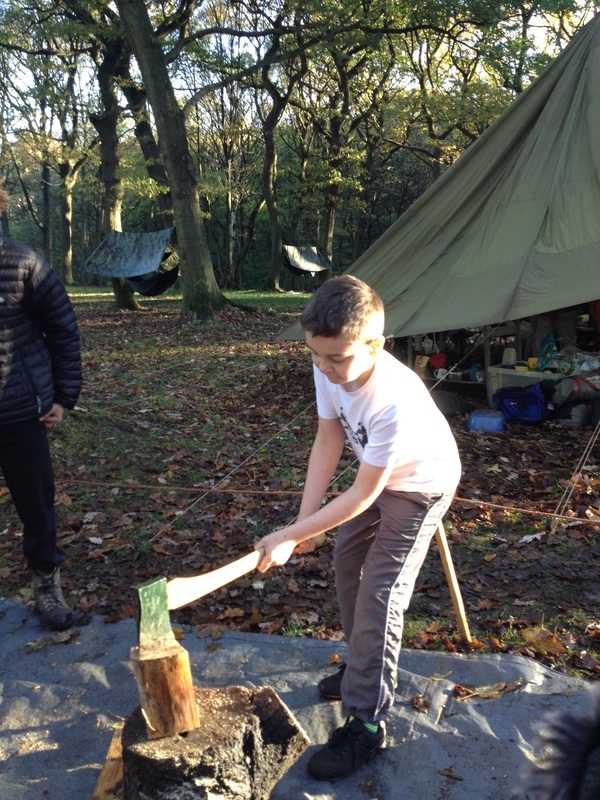 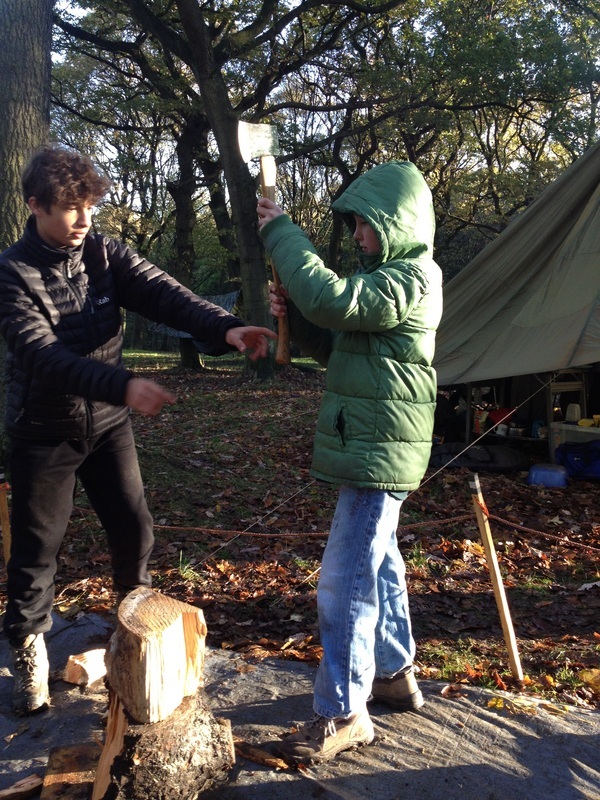 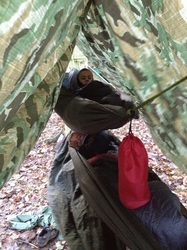 A couple of our new Scouts were invested on this challenge. 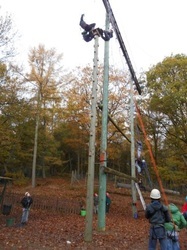 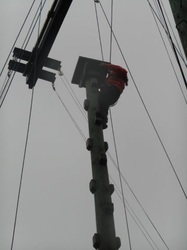 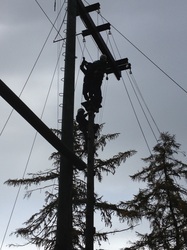 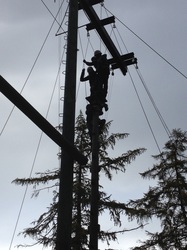 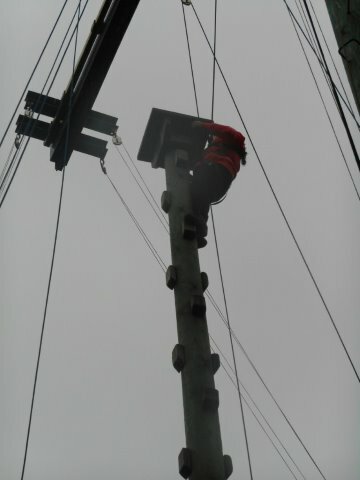 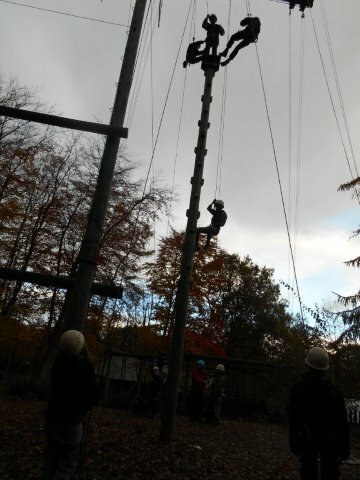 They also tried "all aboard", basically a telegraph pole with a 1 foot square platform on the top. Teams of four had to reach the top and all get on together! Throughout this waves of rain came and went but nobody seemed to notice. 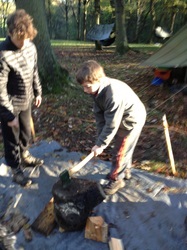 After this we headed back to camp to make pitta pizza and put up the hammocks and tarps. 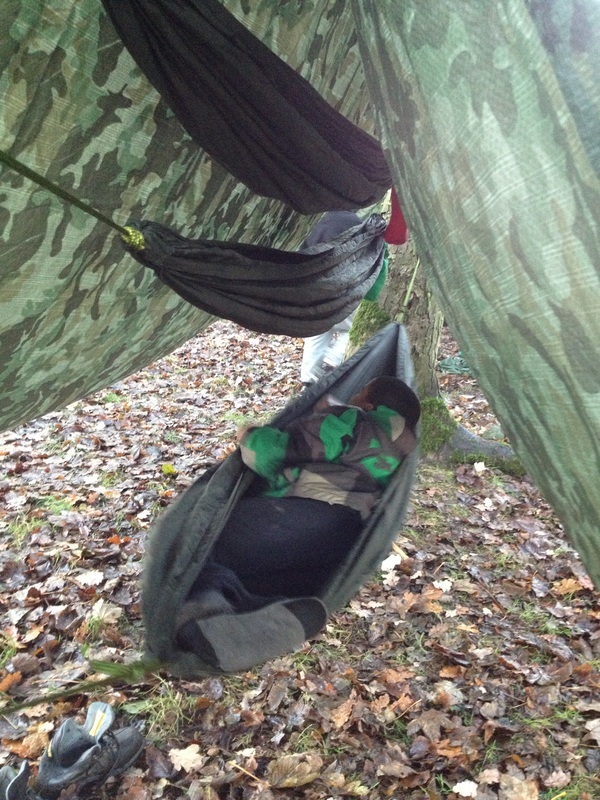 Many Scouts had not slept in hammocks before and couldn't resist trying them, several fell out. 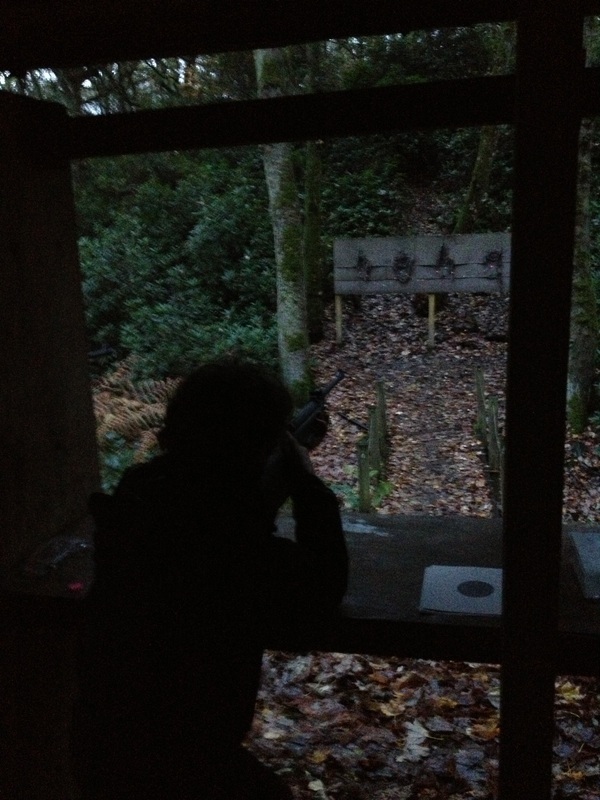 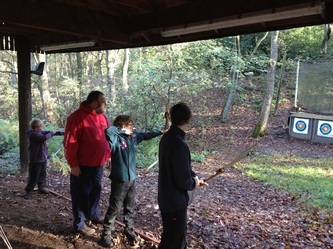 Then it was off to the shooting range for a couple of hours to continue the work to achieve the highly prized "Master-at-arms" badge. 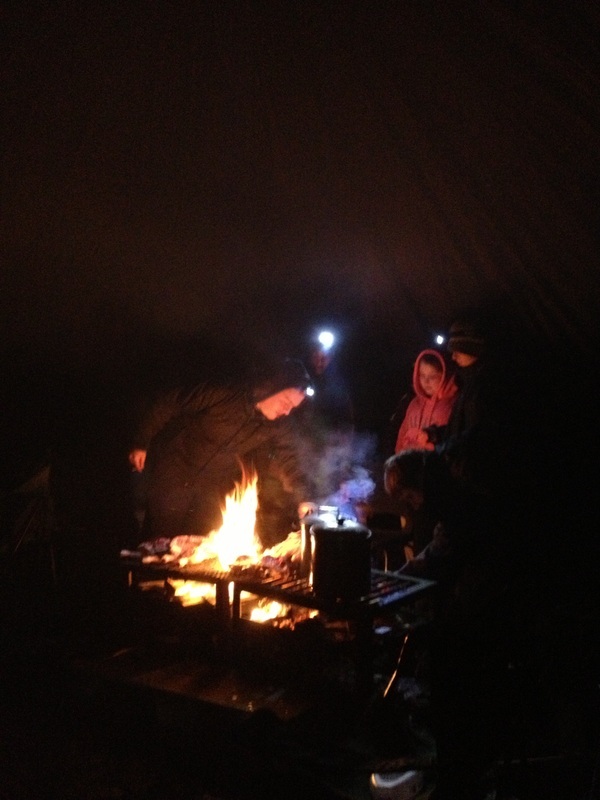 By the time we finished it was getting dark so we headed back to the shelter to cook the evening meal. 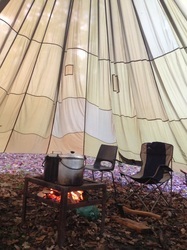 The rain had set in again by this time, with some heavy bursts but we were safe and warm, if a little smoky, under the shelter cooking spatchcocked chicken and rice. 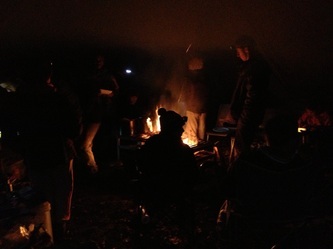 We then invested the remaining new Scouts by firelight then settled down to the serious business of talking rubbish around the fire while eating "camp donuts" (eggy bread with chocolate spread or jam, fried over the fire). 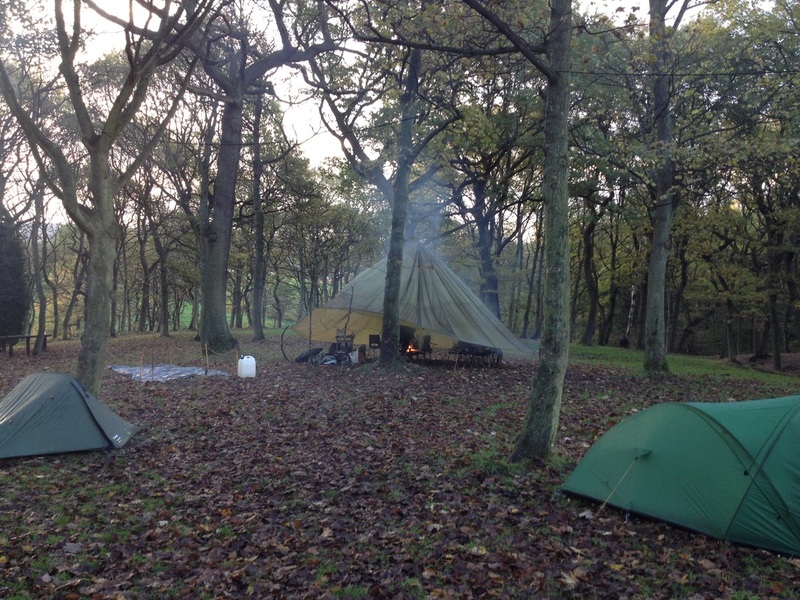 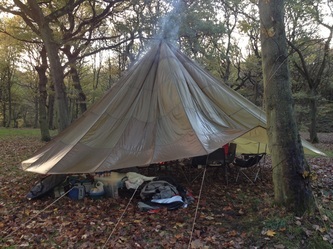 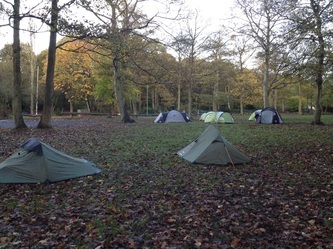 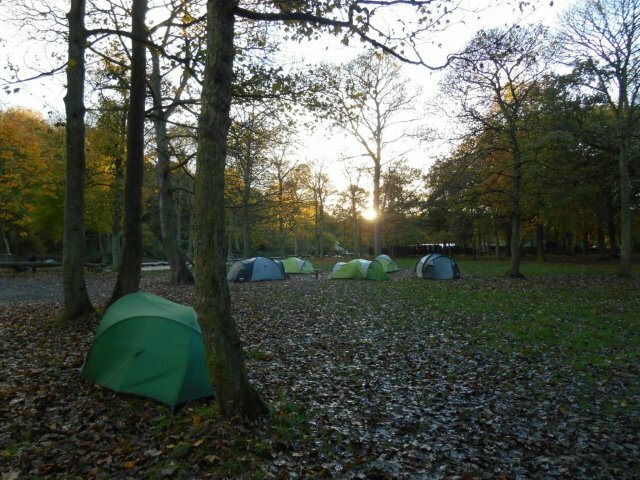 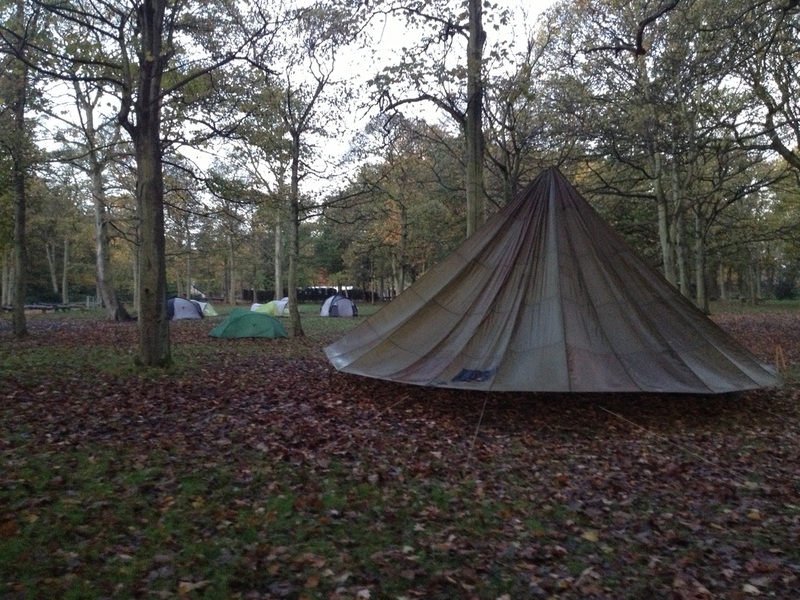 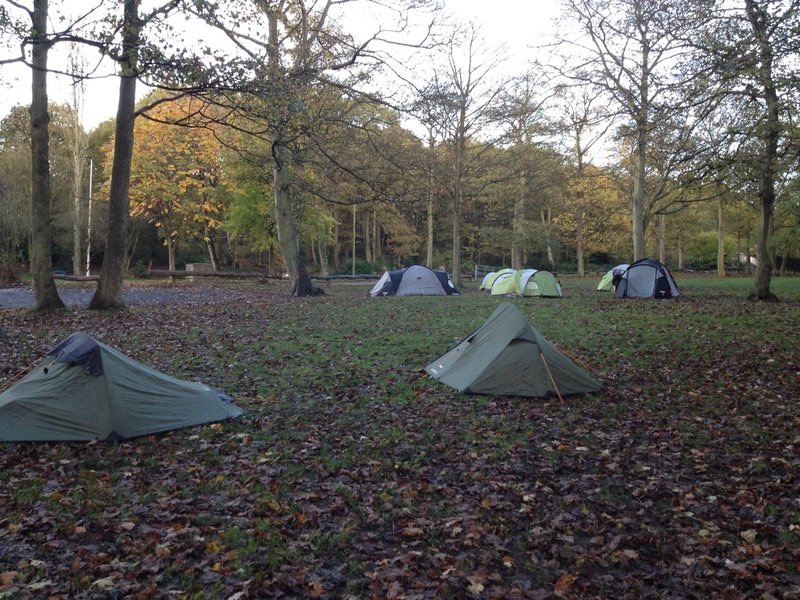 By 21.30 the shelter was empty except for the Leaders, about two thirds of the Scouts went off to their hammocks, the rest went to bed in the tents. 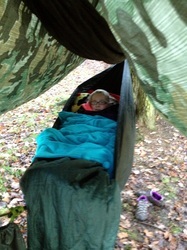 It had been a busy day and the last few laughs and giggles quickly turned to snores. The Scouts had requested a fairly late start at 08.05 (why so specific? 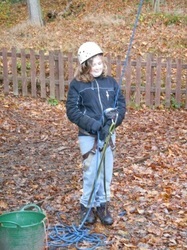 - ask Carys!) 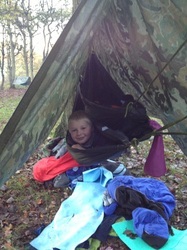 but since they'd had such an early night most were up of their own accord by 07.00. 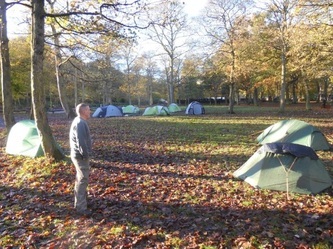 It had been a cold night with some hailstone and we woke up to frost and ice on the tents and shelters but the rain stayed off and the sun shone brightly, although it was still cold. A quick check on the Met Office app told us that the temperature would have hit 0 degrees centigrade last night but with wind chill would have felt like -2. 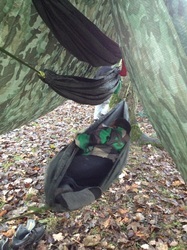 I told Ryan this when I found him up in his hammock to which he nonchalantly replied, "I've done lower!". 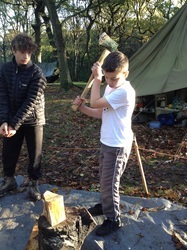 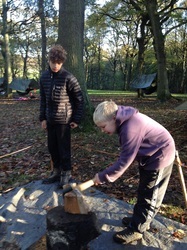 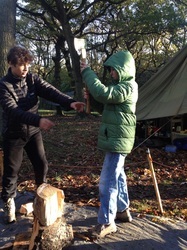 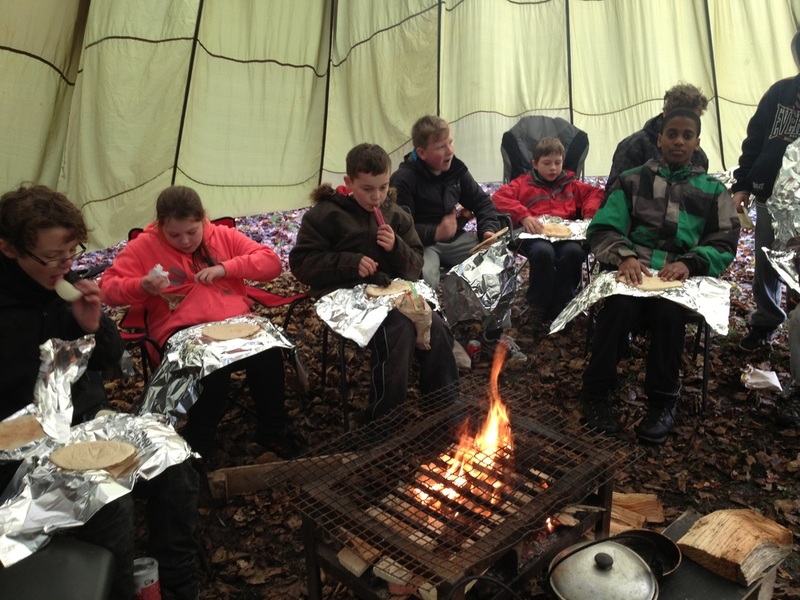 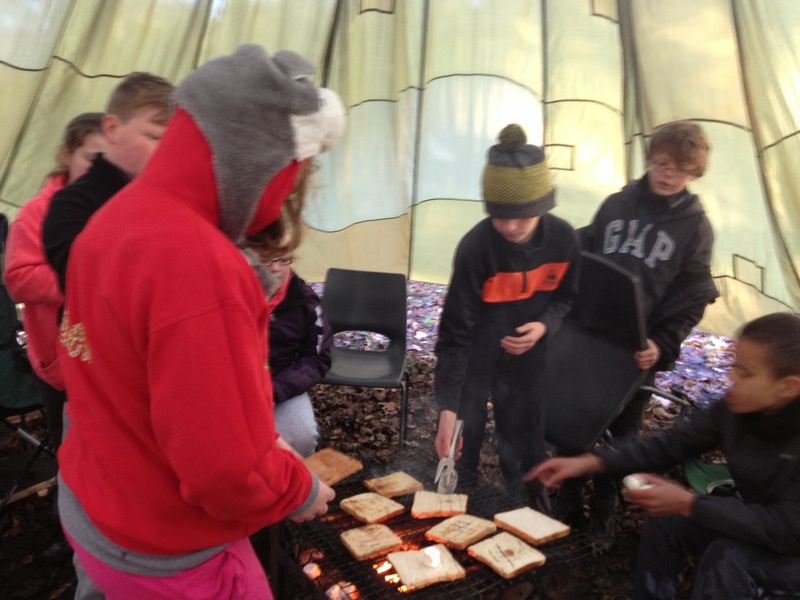 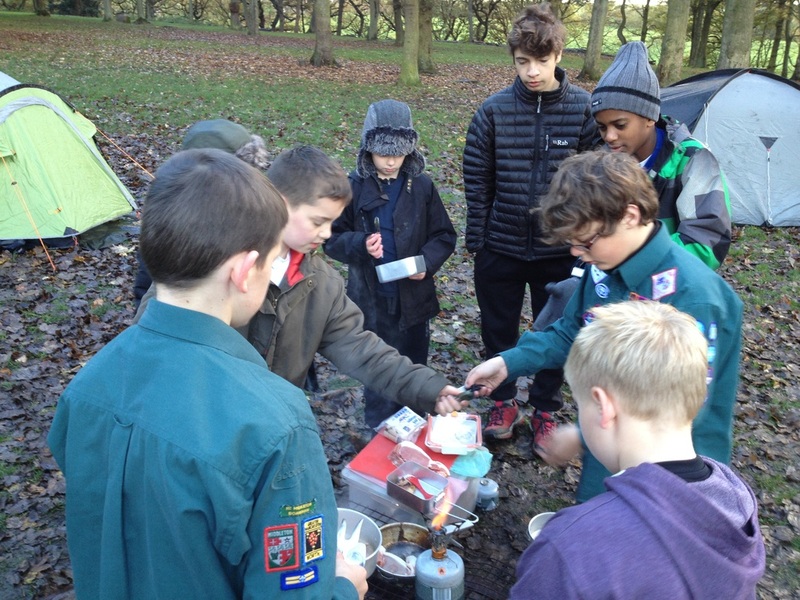 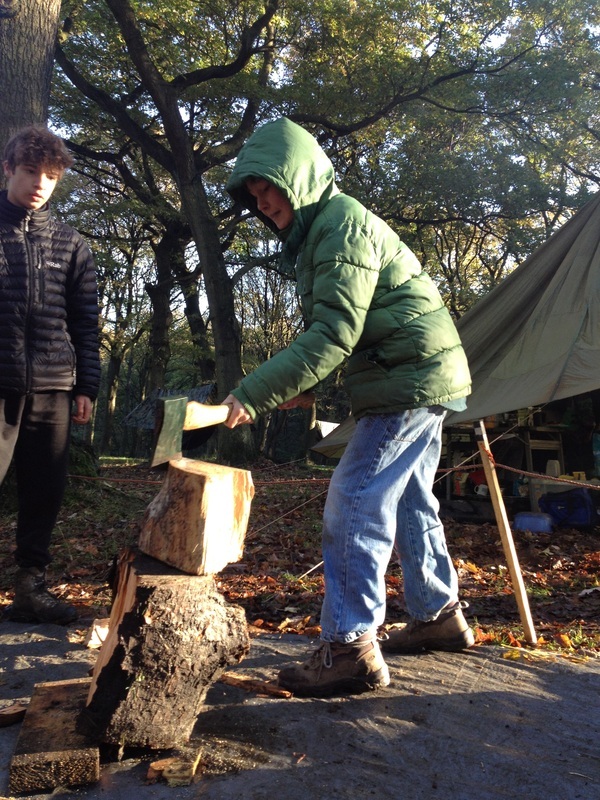 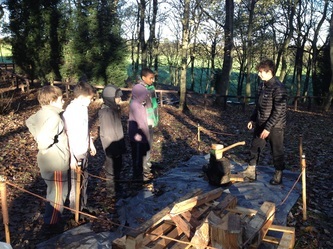 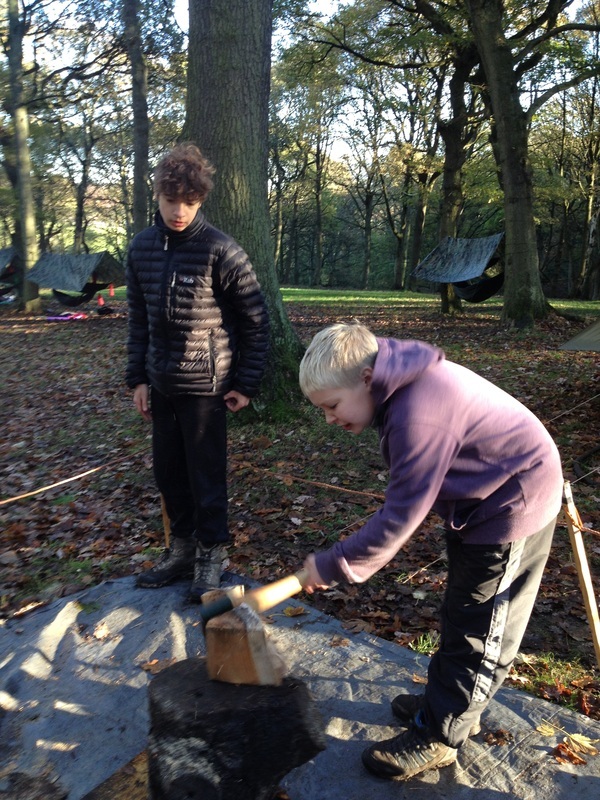 After quickly warming themselves round the fire they again made their breakfast by gas stove - except Daniel, who had his breakfast expertly prepared by one of the Leaders for doing so well and working so hard the day before. 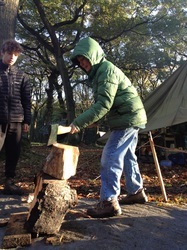 After general cleaning duties and a short session on axe and saw use it was time to change into uniforms then off to the site chapel for a short Remembrance Day service with a 2 minute silence at 11.00. 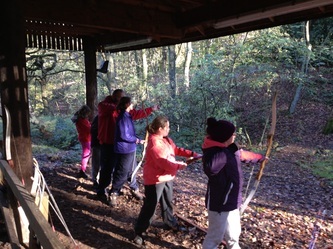 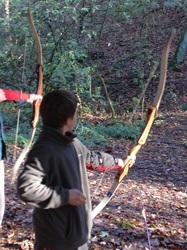 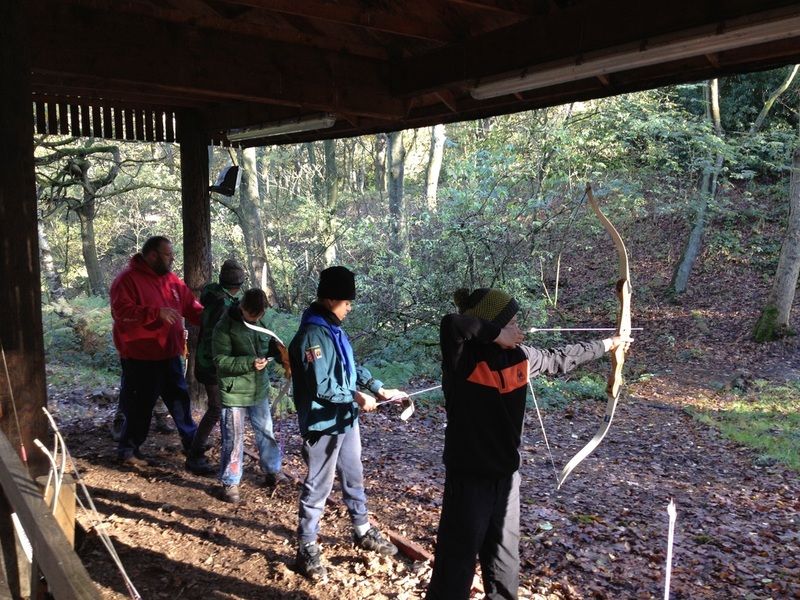 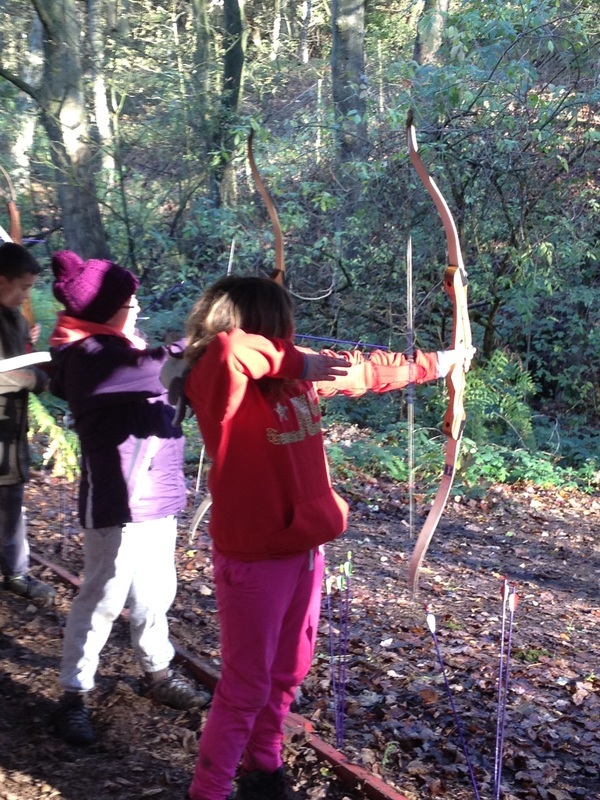 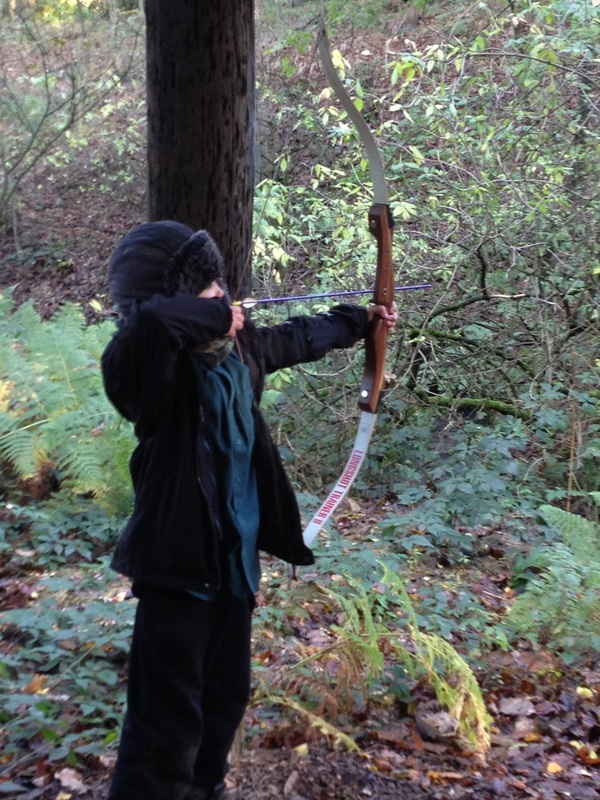 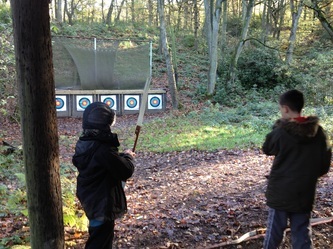 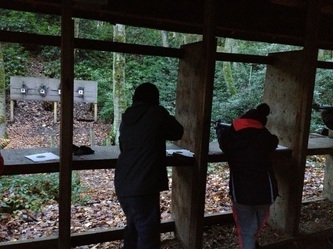 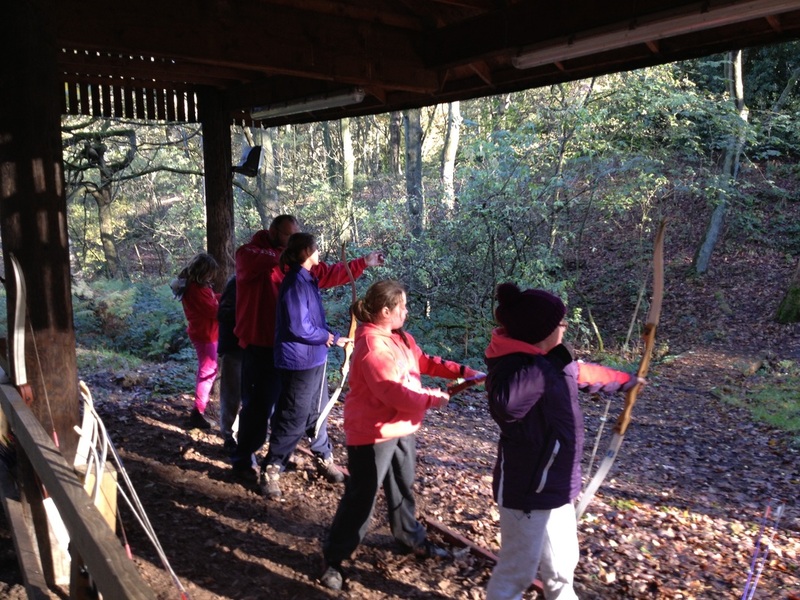 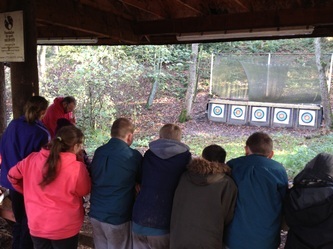 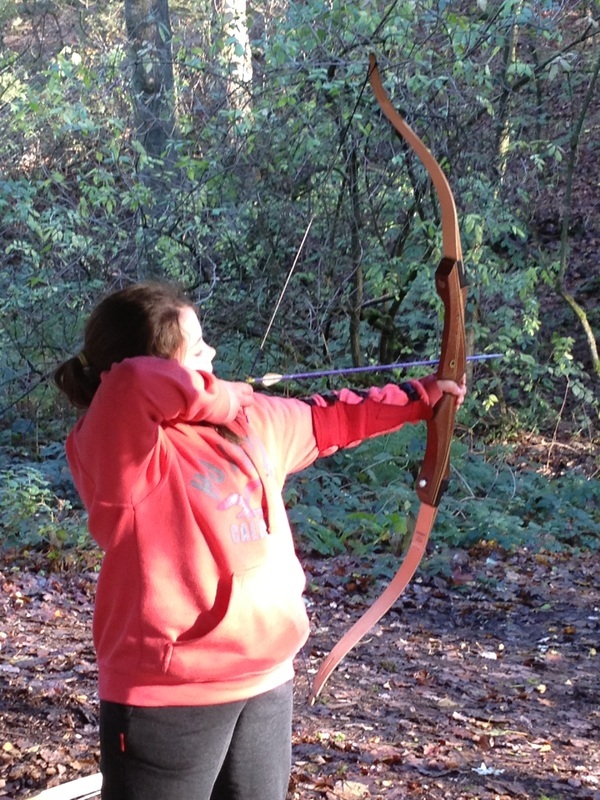 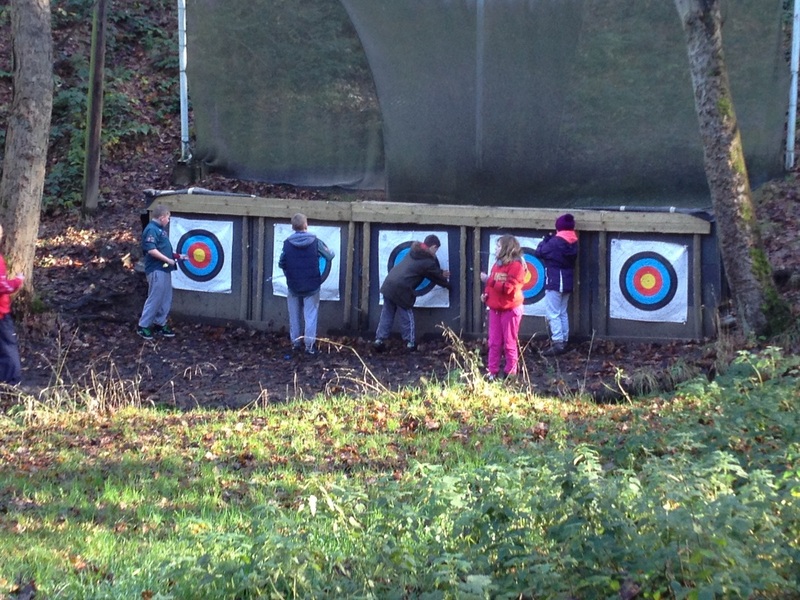 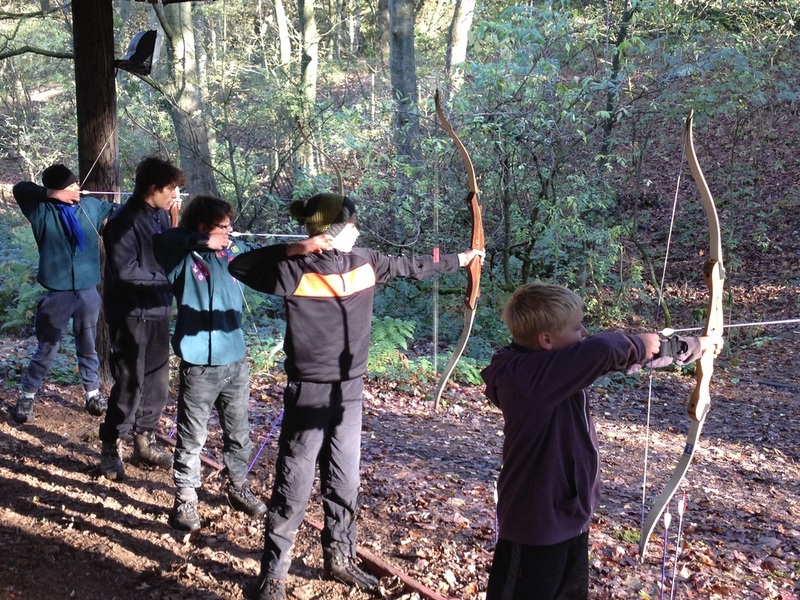 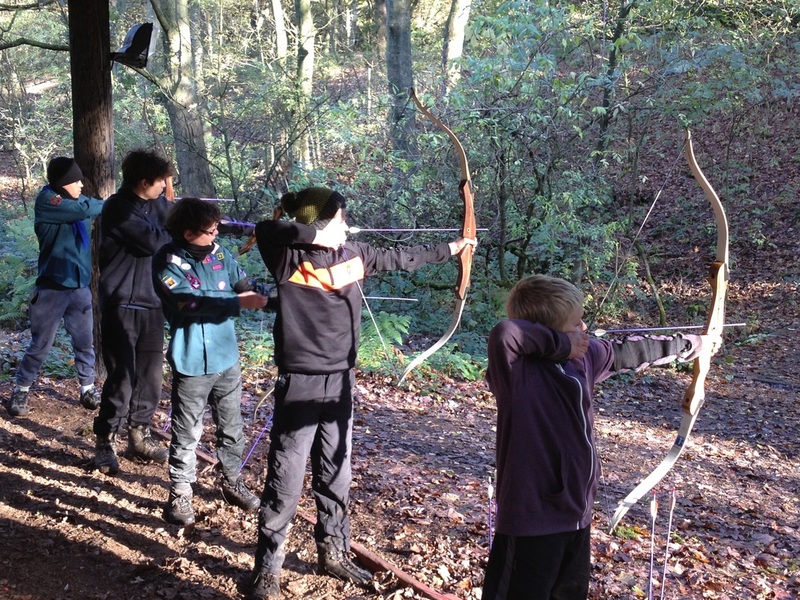 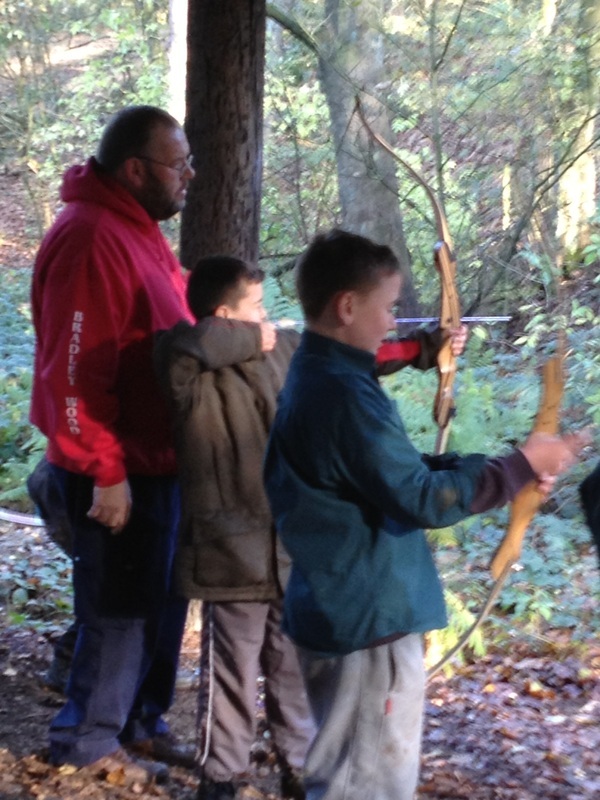 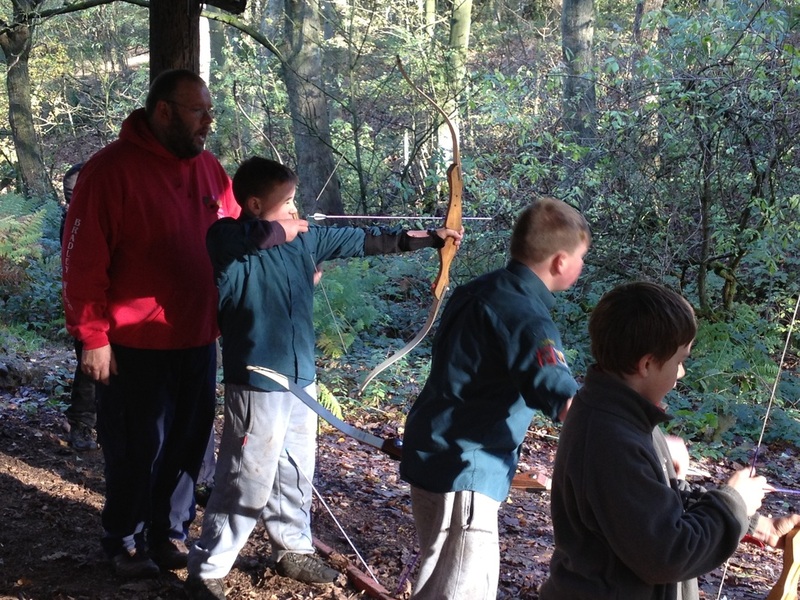 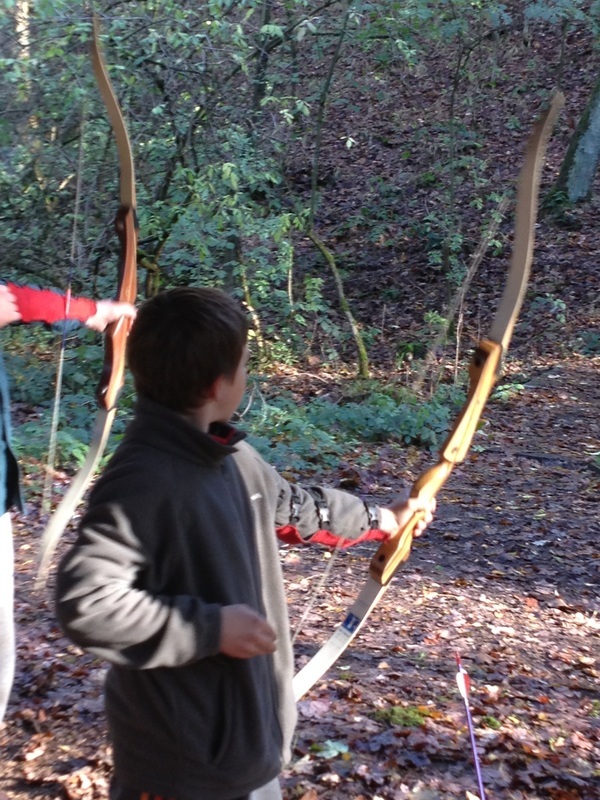 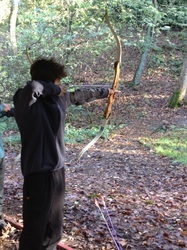 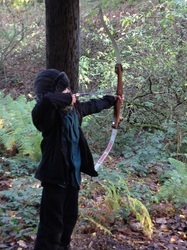 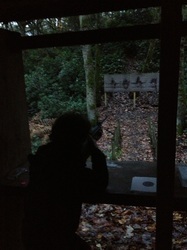 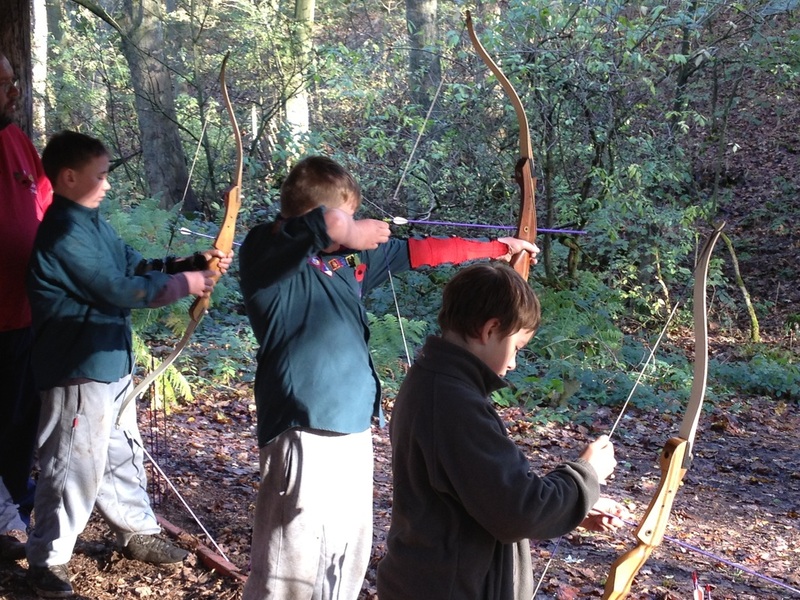 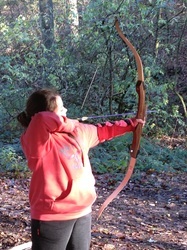 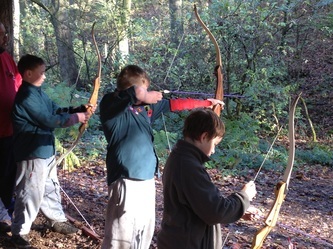 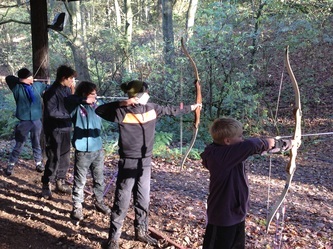 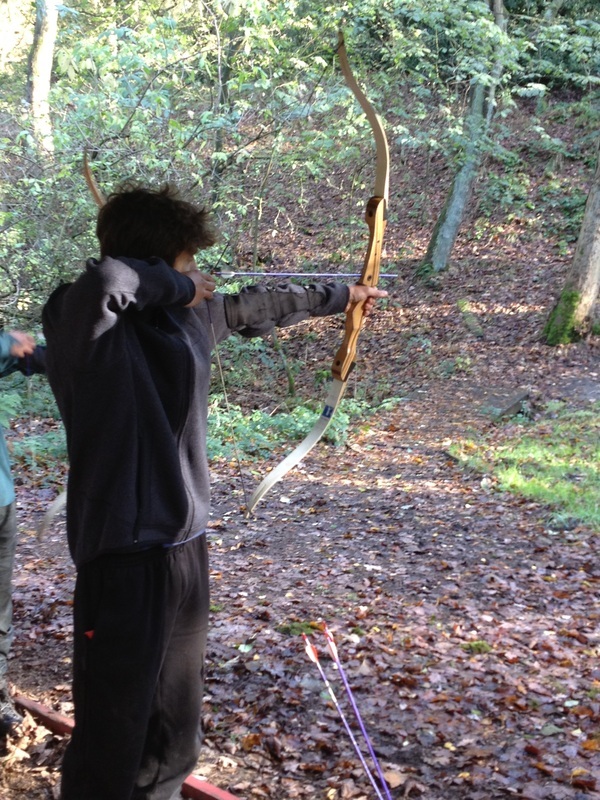 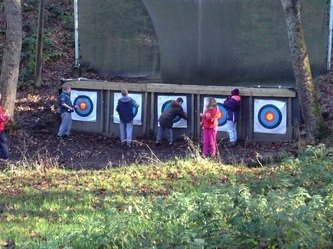 We then had a session at the archery range before heading back to the site for the usual frantic chaos of dropping the tents and shelters and getting everything packed on the coach before heading home. 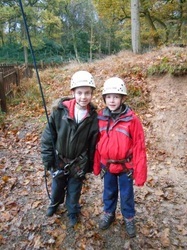 Below are just a few photos, there should be more to follow.